Accidents on the job unfortunately occur when machinery, equipment or the workplace itself is unsafe. Workers and their families may sue on several tort theories of liability, including negligence and strict liability against general and sub-contractors and product manufacturers. As skilled Chicago construction accident lawyers we have represented many individuals injured as the result of a construction accident. Even though you may be receiving workers compensation benefits, you may also have a recovery for your injuries against a party other than your employer. Every year in the US thousands of laborers, construction workers and visitors to construction sites are seriously injured or killed. A construction site is a dangerous place and accidents are difficult to predict or prevent. Employees working at construction sites and visitors to these construction sites have a right to a safe and harm free environment. Both injured construction workers and visitors who are injured while visiting a construction site may be able to file a construction liability lawsuit. The consequences of a construction accident can range from injuries that prohibit victims from earning a living to wrongful death. Some construction injuries can have a severe impact on your quality of life. They could require extensive medical treatment and can lead to financial hardship for you and your family. In the event that a death has occurred as a result of the ATV accident, you can file a wrongful death suit. 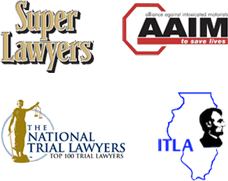 Our Illinois and Chicago Construction accident attorneys are prepared to help you with the legal matters following a construction accident. The personal injury and wrongful death lawyers at Nemeroff Law Offices represent many victims who are injured or killed by the negligence of others. We will help you recover the money damages you or your family is entitled to. At Nemeroff Law Offices our Chicago personal injury attorneys have extensive experience representing victims who have suffered an injury in a construction accident. If you or someone you know has suffered a personal injury in a construction accident, contact the Chicago Personal Injury attorneys at Nemeroff Law Offices. An experienced construction injury attorney can discuss your situation and go over the options available to you. At Nemeroff Law Offices we work with insurance companies and other parties involved in your case to make sure all your needs are handled appropriately.